Astronauts on the International Space Station can look forwardto the arrival of a new resident later this year — a 300-pound robot namedRobonaut 2. Robonaut2, or R2 for short, will be the first human-like robot to become a permanentresident at the space station when it arrives on a shuttle mission slated toSeptember. The robot consists of a head and torso with two arms and two hands. 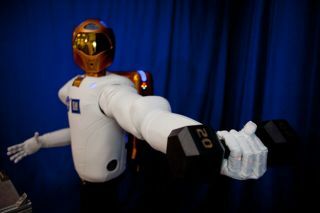 The dexterous robot not only resembles a human, but isspecifically designed to operate like one. With the help of advanced control,sensor and vision technologies, R2 is built to use its arms and hands tooperate the same tools that station astronauts use. In the future, the greatest benefitsof humanoid robots in space may be as assistants or stand-ins forastronauts during spacewalks or for other tasks that are too difficult ordangerous for humans, NASA scientists said. "The project exemplifies the promise that a futuregeneration of robots can have both in space and on Earth, not as replacementsfor humans but as companions that can carry out key supporting roles,"said John Olson, director of NASA's Exploration Systems Integration Office atNASA Headquarters in Washington. R2 will launch on space shuttle Discovery as part of theSTS-133 mission that is currently planned for September. Once aboard the space station,engineers will monitor how the robot operates in weightlessness. Throughout its first decade in orbit, the InternationalSpace Station has served as a testing ground for human and robotic teamwork forconstruction, maintenance and science. Construction of the station began in1998. It is now nearly complete. "The combined potentialof humans and robots is a perfect example of the sum equating more than theparts," Olson said. "It will allow us to go farther and achieve morethan we can probably even imagine today." NASA plans to confine R2 to operations in the station's U.S.Destiny laboratory at first, but future enhancements and modifications mayallow the robot to move more freely around the station's interior or outsidethe complex. For now, however, R2 is still a prototype and does not haveadequate protection needed to exist outside the space station in the extremetemperatures of space. Testing the robot inside the station will enable researchersto observe how R2 functions in an important intermediate environment. R2 willbe tested in microgravity and subjected to the station's radiation andelectromagnetic interference environments. The interior operations will provide performance data, givingscientists an idea of how a robot may work side-by-side with astronauts. Asdevelopment activities progress on the ground, station crews may be provided withhardware and software to update R2 to enable it to perform new tasks. ? R2 is currently undergoing extensive testing in preparationfor its flight. The robot was developed by NASA in partnership with GeneralMotors (GM) under a cooperative agreement to developa robotic assistant that can work alongside humans, whether they areastronauts in space or workers at GM manufacturing plants on Earth. While R2 is set to assist astronauts at the InternationalSpace Station, vibration, vacuum and radiation testing along with otherprocedures being conducted on R2 at this time also benefit the team at GM. Theautomaker plans to use technologies from R2 in future advanced vehicle safetysystems and manufacturing plant applications. "The extreme levels of testing R2 has undergone as itprepares to venture to the International Space Station are on par with thevalidation our vehicles and components go through on the path toproduction," said Alan Taub, vice president of GM's global research anddevelopment. "The work done by GM and NASA engineers also will helpus validate manufacturing technologies that will improve the health and safetyof our GM team members at our manufacturing plants throughout the world,"Taub stated. "Partnerships between organizations such as GM and NASA helpensure space exploration, road travel and manufacturing can become even saferin the future." The idea of using dexterous, human-like robots that arecapable to using their hands to do intricate work is not new to the aerospaceindustry. The originalRobonaut designed for space travel was built by the software, robotics andsimulation division at Johnson Space Center in Houston, in a collaborativeeffort with the Defense Advanced Research Project Agency 10 years ago.